Bay Alarm Medical is a medical alert system offering 24/7 monitoring and trained professionals to help in urgent times of need. Bay Alarm Medical has been protecting their clients for almost 70 years. Highlights for the company include free monitoring for spouses and for other family members, as well as overwhelmingly positive customer reviews. Considering the customer accolades, Bay Alarm Medical deserves our 2018 "Best Service" award. Bay Alarm Medical excels at providing remarkable customer service and products for their customers. When we first opened the box, we saw the GPS Alert System, a first responder medical information magnet, and an information packet. The information packet contained a “thank you” note, an in case of emergency form to be filled out and sent back (can also be emailed or over the phone), and an instructional guide for unboxing and starting the system. All the equipment was thoughtfully packed and showed no signs of wear or tear. Every piece was secured in a plastic bag and nestled in a foam cut out placed inside the box. We set up the device by first plugging in the base, then putting on the adjustable band. In just a few minutes we pressed the help button and a monitoring center associate answered and help with the activation process. How Does a Bay Alarm Medical Alert System Work? 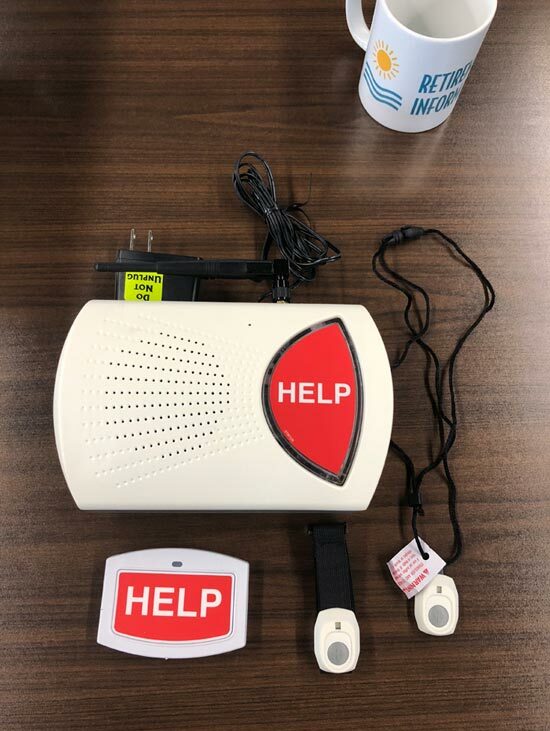 Once you have setup your Bay Alarm Medical alert system, you can call for help by pressing the help button on either your wristband or pendant. Bay Alarm Medical alert systems requires a base station with a help button along with a pendant or wristband worn around your neck or wrist. When you hit the help button, you are connected to the Bay Alarm Medical emergency representative. The representative can call for emergency help (911) if the user needs help, or alert a caregiver. 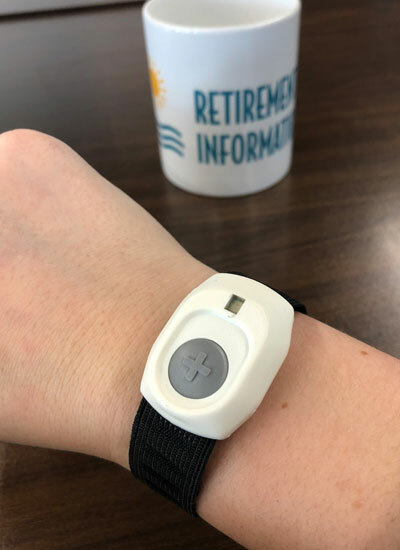 Similarly, if you fall while wearing a Bay Alarm Medical pendant/wristband along with the fall detection, the alert system will contact the Bay Alarm Medical monitoring center and dispatch help as needed. Bay Alarm Medical offers multiple levels of protection so they can offer the right protection for each customer. The standard level package includes the base station, push-button wristband or pendant, and the Vial of Life magnet. 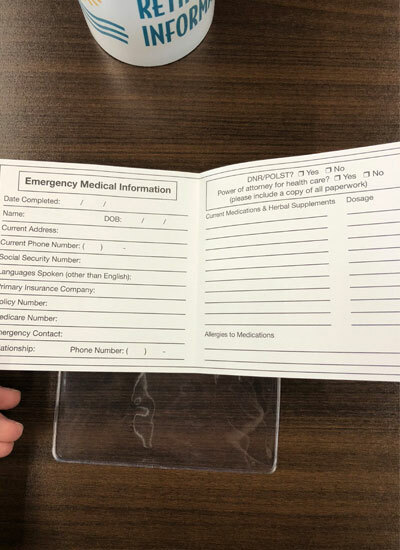 The Vial of Life magnet is a pamphlet for consumers to provide their health and medical information for first responders and family members in time of emergency. These come with every order. With the standard level package, you are able to choose whether you want to use a cellular base or one that plugs into a landline. Along with the base station, you are able to add a few accessories. One accessory is a wall help button. It is an additional help button which can be attached to any wall in a room. Another add-on is the GPS alert system, powered by AT&T’s 3G network. 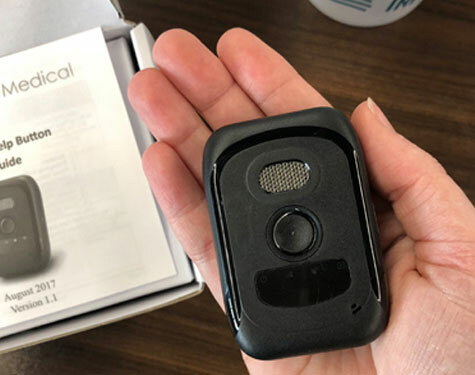 For an additional charge each month, this device works as a portable pendant and a tracking device for caregivers. The GPS alert system comes with a one-time device fee of $49. This device comes with a necklace, portable belt clip, charging base, and can be upgraded to a fall detection device. The fall detection device is another pendant worn and automatically calls emergency services of a fall. An additional fall detection device can be purchased for a monthly charge. Bay Alarm Medical offers one package with a few accessories to add on. Each accessory purchased adds on an additional charge each month. Also, if the home the system is set up it does not have a landline, Bay Alarm Medical teamed up with AT&T to offer cell coverage instead of a phone line. This would be used on their 3G network. There is also an additional charge for the fall detection device. The GPS requires a one-time device fee and an additional monthly charge. Each package purchased comes with free activation, 30-day risk-free trial, free shipping (if the semi-annual or quarterly payment plan is chosen), and a free lockbox for the front door (if the semi-annual payment plan is chosen). Bay Alarm Medical offers discounts for consumers who are members of various senior organizations including AARP, USAA, AMAC, American Seniors Association, and more. Bay Alarm Medical has two call stations operating 24/7. These facilities are located in Ogden, Utah and Rexburg, Idaho. These facilities are complete duplicates of each other and provide back up if one were to go offline. They are CSAA Five Diamond Certified and go through a certification process each year. All Bay Alarm Medical equipment is under a warranty provided by Bay Alarm Medical. Under this warranty, Bay Alarm Medical will replace any equipment worn or broken due to wear or tear or manufacturing defect for free. They also offer a Premium Protection Plan which includes a surge protector and a one-time replacement of the surge protector or the base in the event of one breaking. After a replacement has been made, the warranty is void. They do allow to buy another warranty if needed. 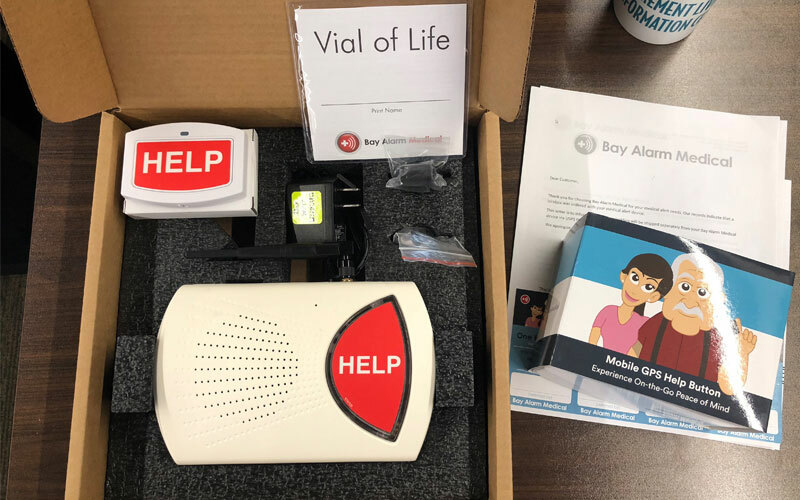 The system is silently tested by Bay Alarm Medical every week, but Bay Alarm Medical suggests you test it once a month by pressing the help button and letting the representative know you are testing the system. Bay Alarm Medical does not require a long-term contract, but they have a semi-annual up-front payment plan. If the semi-annual payment plan is chosen but you want to return your equipment before the 6 months is over, Bay Alarm Medical will refund unused months. The Bay Alarm Medical money back guarantee is for 30 days from purchase of the product. If within the first 30 days, if you decide to return the medical alert system for any reason, you will receive a full refund. There are no additional restocking fees or shipping fees. Both the Bay Alarm Medical pendant and wristband are waterproof. The base station, however, is not. The GPS system lasts up to 72 hours between charges. For the In-Home systems, the batteries in the wristbands or pendants should last the life of the system. How do I order a system? You can order the system on their website and checkout is done in 6 easy steps. You can also order over the phone by calling their toll-free number. Bay Alarm Medical is a good choice medical alert system with many upgrades to expand your protection. For more information about other medical alert system companies, check out our complete guide to medical alert systems. Bay Alarm Medical is not a good or recommended company to work with. The unit was destroyed in a fire and even after 4 requests for them to cancel the service, it was still not cancelled. The people on the phone were nice enough, but horrible cancelation policy. This company did not respond to my setting off the alarm four times by accident. No call to see if I needed assistance. Really unreliable way to treat elderly, sick and handicapped. I don't know where or who gives them 5 stars, perhaps people who never called for emergency service. This company failed to enter my credit card accurately, didn't bill for 9 months, then In October 2018, without notification, of their error, took the entire nine months from my card. I pay my debts, so that is not the issue. The issue was their admitted error. I closed my account the last week of October. I talked to supervisors, billing, and representatives. In November they said I had a refund coming. First week of December, said "You have no refund coming We gave you a credit." I thought that the end of it. Dated December 19th, I received Dec 22, '18, I received an email notice three more months would be withdrawn from my "closed account." I called this am, and was assured I would not be billed. My experience with Bay, is I won't count on that... no more than I could count on their emergency service or billing.